The rapper/ actress/ singer bids for jazz legitimacy. One wonders why she bothers to try. Who is Queen Latifah? Her name is Dana Elaine Owens of Newark, New Jersey. She's 37 years old and she played power forward on her high school basketball team. In 1999, she published an autobiography called Ladies First: Revelations of a Strong Woman. She is currently a spokesperson for Cover Girl cosmetics, Curvation Ladies Underwear and Pizza Hut. Who is Queen Latifah? She is a versatile actress who has starred in situation comedies (Living Single on Fox), played supporting roles in dramatic films (such as Spike Lee's Jungle Fever), starred in comedies and romantic comedies a-plenty (Last Holiday, Bringing Down the House), and played large roles in recent movie musicals (Chicago and most recently Hairspray). Her work as an actress has been well reviewed and has been in successful projects. She has also worked as a producer and executive producer of her films. Who is Queen Latifah? Well, originally, she was a young beat-boxer and then rapper who released her first album on Tommy Boy in 1989, the first of four. Though her persona was first formed in this hip-hop guise, Latifah has not released a hip-hop recording since 1998. And now Queen Latifah is a jazz singer too? Hmmm . . . .
Queen Latifah is, at this point, an entertainment juggernaut. She is smart and talented, and one of her talents certainly is singing. She is a businesswoman looking, dare I say, to diversify. Clearly grounded in classic R&B and show tunes, Latifah has the basic chops to sing standards and, in fact, she's done it before. But Trav'lin' Light is her first recording for a real jazz label, Verve, and it is being accompanied by a tour of ‘serious’ venues such as The Hollywood Bowl. The Dana Owens Album in 2004 was largely a jazz disc, with tunes like "Lush Life" and "Moody's Mood for Love" (as well as more contemporary standards such as "California Dreamin'"), so this latest recording is more than just a lark. Here, Queen Latifah asks us to take her seriously as a jazz singer for real. She seems to be saying this is some grown-up music so take me seriously. So? Latifah gets away with everything she tries here, no question. She has a pliant voice with a nice mixture of strength, clarity, and blues tone. And the disc is chock full of tasty guest spots that tend to help the effort rather than overshadow the leader. The problem, though, is in the excessive variety and (therefore) anonymity of the interpretation. 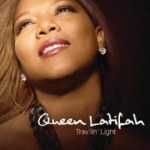 On Trav'lin' Light, Latifah casts herself in several different "jazz singer" roles. She's a subtle bossa nova singer on "Quiet Nights". She fronts a roaring big band on "I Love Being Here with You" and "I'm Gonna Live Till I Die". She interprets pop classics on "Poetry Man" and 10cc's "I'm Not in Love". On all of these tracks, Latifah is competent but vaguely bland. We recognize that it's her because we've heard her voice so many times before. Like a talented mimic, she passes as a credible vocalist in these various styles, but she never makes any of these songs her own. You wouldn't say it was like she was fronting a wedding band, but you might call these versions of familiar styles "formulaic". "Poetry Man" is so similar to the original by its composer, Phoebe Snow, that it is a certainty that Latifah "learned it from the record", memorizing the "oooh"s and "yeahs"s as well as the words. And this seems particularly pointed because Snow is herself such a distinctive and masterful singer who deserves to record for Verve more than Latifah. The Queen sounds best here when she's not trying so hard to sound legitimately "jazz". Her cover of Smokey Robinson's "What Love Has Joined Together" feels free and easy if not entirely original. Better is "Gone Away", a Curtis Mayfield/Donny Hathaway song that feels less like it is a dress-up exercise for Latifah. The best performance, by a long-shot I'd say, is "Georgia Rose", where Latifah tackles a rarely-sung tune that has hip lyrics and cool set of harmonies that allow Stevie Wonder to play tasty harmonica around the leader and in a featured solo. Stevie, of course, is able to do what Queen Latifah is not up to as an interpretive musician. He can be utterly himself on old material without sounding like he's faking it. It's a bit odd how the album ends with a tune straight off the Hairspray soundtrack. On this more anonymous track, a track not weighed down with a history of interpretations by Carmen McCrea, Billie Holiday, Sarah Vaughan, and the like, Quen Latifah seems about to just sing out without any odd stylization or affected coolness. You sense Latifah at the edge of the stage, letting her considerable charisma and acting talent sell the song. The orchestra swells, the chorus lifts behind her, the story of the show is suggested if not told. Which suggests the question: why make a "jazz" record if you're not really a jazz singer? What kind of credibility or cool does it imply for a performer who, on the indisputable evidence, is credible in so many other areas? Queen Latifah is on the road with a 10-piece jazz group now selling her new persona. I suppose we could ask her. Reviews of these concerts suggest that she is not answering with clarity or certainty, that the band behind her (sans Stevie, Joe Sample, Christian McBride and other ringers on the disc) is fairly bland, but that the Queen's personality still carries the day. On a mere compact disc or set of MP3s, however, there is no charisma oozing from your speakers or headphones. There is just another pseudo-jazz bid for sophistication or hipness, partly successful but mostly just un-embarrassing. It's proof, perhaps, that jazz remains an essential American cultural touchstone. But must everyone give it a go?